Stewart Park is a 120-acre park in the suburb of Marton, located in the south of Middlesbrough, North Yorkshire, England. It is bounded by the A172 (Stokesley Road), the B1380 (Ladgate Lane) and the secluded residential road The Grove. The park has been awarded a Green Flag Award by the Civic Trust. The site of the cottage where Captain James Cook was born can be found in the park. Although the building has long since disappeared, a pink granite urn marks the approximate site. Nearby is the Captain Cook Birthplace Museum. The 'lost village' of East Marton was also in the park area and an archaeological geophysical survey in September 1998 showed evidence of the village. In 2003 Stewart Park was the subject of Channel 4's archaeological television programme Time Team, presented by Tony Robinson. The park was initially landscaped by Henry Bolckow, one of Middlesbrough's ironmasters and the borough's first mayor. Bolckow built Marton Hall in the park in 1858. The park was eventually bought by Councillor Thomas Dormand Stewart in 1924 for the people of Middlesbrough. He intended it to be "a public possession, open and accessible to all the people at all times". Stewart Park was officially opened to the public on 23 May 1928. In January 1959, J A Kenyon, the Borough engineer stated in a report, "The Hall....was of no wide historic or architectural value" and that renovations would cost in the region of £25,000. The council reluctantly made the decision to demolish the building. Work to demolish the Hall started in May 1960 but on 6 June a fire broke out and tore through the building. Not even ten fire appliances could stop the fire owing to the lack of water supply in the area. The monument of Middlesbrough's industrial revolution was destroyed. The hall's conservatory continued to be open to the public for a number of years but was eventually demolished in the mid-1990s. A stone loggia next to the Museum is all that is left of what was once Marton Hall. The remaining Victorian estate buildings were later utilised as park depot buildings and council offices. Today the park covers about 120 acres (0.5 km2) and consists mainly of mature woodland and arboretum on the south side, with open parkland on the northern (Middlesbrough) side. The Captain Cook Birthplace museum is situated in the middle of the park and also has a shop and Cook’s Cafe inside. There are two lakes, which are the home to Canada and greylag geese, moorhens, coots and various types of duck. An extensive pets' corner houses many types of domesticated animals: fallow deer, highland cattle, llamas, goats, peacocks, pheasants, rabbits and guinea pigs. In the past the park was plagued with Myxomatosis, quite probably introduced by people abandoning their pet rabbits in the park. Part of the Victorian estate complex has been opened up to the public and now includes a cafe, toilets and visitor centre. Various nature, heritage, orienteering and tree trails are provided in the park and are popular with school visits. New play areas for children have been built including a climbing frame named after Captain James Cook's ship, the Endeavour. The Captain Cook Birthplace Museum building also has Cook’s Cafe inside which is free to go to all year round. The Cafe offers a range of hot and cold food, sells soft drinks, slush, ice lollies and amazing gelato ice cream. The temple, loggia, Captain Cook memorial and Victorian estate complex are all listed buildings. The Captain Cook Birthplace Museum holds regular events throughout the year along side the regular opening of this fantastic Museum. The museum building also has Cook’s Cafe inside which is free to go to all year round. The Cafe offers a range of hot and cold food, sells soft drinks, slush, ice lollies and amazing gelato ice cream. A Parkrun takes place every Saturday morning at 9am. Since April 2014, Northern Dales Farmers Market have held a monthly event in the park. The market is usually held on the last Sunday of the month and also includes a craft fair in the visitor centre. The park also hosts larger events in the summer such as the Cleveland Show and gypsy fairs. It has also been the venue for various BBC Radio 1 events. York based Askham Bryan College runs courses from an animal care and horticulture training centre located in the Victorian estate complex. In 2015, ownership of the Grade II listed Central Lodge building was transferred to the college from Middlesbrough Council with plans to carry out extensive repair work on the building, turning it into a learning resource centre whilst also allowing public access. Renovation work began on the Central Lodge in January 2017 after an award of £3m from the Heritage Lottery Fund and included repairs to the roof and the general fabric of the building, the creation of lecture rooms, a science lab, animal handling areas, workshops and a reception area. The Central Lodge building reopened to students in September 2017 and is Askham Bryan College's principal land-based education centre in the Tees region. Wikimedia Commons has media related to Stewart Park, Middlesbrough. Other Middlesbrough parks: Albert Park. ^ "Stewart Park". Middlesbrough Council Website. Retrieved 23 November 2014. ^ "Green Flag Award Winner: Stewart Park". Green Flag Award Website. Retrieved 16 March 2019. ^ love middlesbrough blog: Rob Nichols (25 October 2016). "On the Trail of Young James Cook". Retrieved 12 February 2017. ^ Channel 4. "Team Big Dig Park 1; Site name: East Marton. Location: Stewart Park, Marton, Middlesbrough". Archived from the original on 30 January 2010. ^ "Stewart Park Central Lodge". Middlesbrough Council Website. Retrieved 23 November 2014. ^ Gallagher, L. (2009). Memories of Stewart Park. The Friends of Stewart Park Publishing. p. 25. ^ Gazette Live Website (1 April 2014). "Remember When: In pictures - The demolition of Marton Hall". Retrieved 12 February 2017. ^ "Temple Circa 150 Metres South West of Captain Cook Birthplace Museum". ; "Loggia Circa 20 Metres South of Captain Cook Birthplace Museum". ; "Memorial to Captain James Cook". ; "Stewart Park Depot". British Listed Buildings. Retrieved 1 August 2014. ^ "North East England Farmers Markets". North East England Farmers Markets Website. Retrieved 16 March 2019. ^ "Farmers' Market and Craft Fair returns to Stewart Park". Love Middlesbrough Website. Retrieved 30 November 2014. ^ "Cleveland Show". Cleveland Show Website. Retrieved 18 March 2019. ^ "BBC Radio 1 BIG WEEKEND 2019: Middlesbrough". BBC Website. Retrieved 18 March 2019. ^ "Askham Bryan College: Middlesbrough Campus". Askham Bryan College Website. Retrieved 30 November 2014. ^ "STUDENTS BREATH NEW LIFE INTO HISTORIC FORMER STABLES". Askham Bryan College Website. Retrieved 22 September 2017. 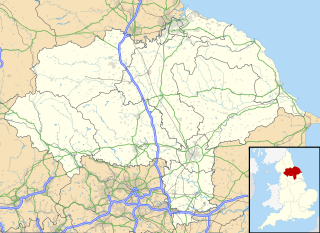 Thornaby-on-Tees is a royal charter town, civil parish and former borough in North Yorkshire, England. Historically part of the North Riding of Yorkshire, Thornaby is situated on the south bank of the River Tees, directly south-east of Stockton-on-Tees and 4 mi (6 km) southwest of Middlesbrough. It has a population of 24,741 according to the 2011 census and is in the unitary authority of Stockton-on-Tees. Middlesbrough College, located on one campus at Middlehaven, Middlesbrough, North Yorkshire, England, is the largest college on Teesside. Teesville is an area of Middlesbrough in the north east of England and is part of the unitary authority of Redcar and Cleveland and in the ceremonial county of North Yorkshire. It has a population of approximately 7,000 residents. It is between South Bank and the River Tees, to the north, and Normanby, Eston and the Eston Hills, commanding an excellent view of the monument at Eston Nab, to the south. Marton railway station is located on the outskirts and serves the suburb of Marton, Middlesbrough, in the ceremonial county of North Yorkshire, England. The station is part of the Esk Valley Line and is approximately 3 miles (5 km) south east of Middlesbrough railway station. Being just within the borough of Redcar and Cleveland, it can be accessed from the B1380, between Stewart Park and Ormesby Hall. It is operated by Northern who provide all of the station's passenger services. Derby Arboretum is a public park and arboretum in the city of Derby, England, located about 1 mile (1.6 km) south of the city centre in the Rose Hill area. It was opened in 1840, following the donation of the land by local philanthropist Joseph Strutt, and to designs by John Claudius Loudon. It was the first publicly owned, landscaped, urban, recreational park in England. After many years of neglect, the Arboretum was extensively refurbished in the early 21st century with the aid of a Heritage Lottery Fund grant of almost £5 million. It is listed as Grade II* on the English Heritage Register of Parks and Gardens of Special Historic Interest in England. The Morris Arboretum of the University of Pennsylvania is the official arboretum of the Commonwealth of Pennsylvania. It is located at 100 East Northwestern Avenue, Chestnut Hill, Philadelphia, Pennsylvania. The arboretum is open daily except major holidays; an admission fee is charged at the gate. Dorman Museum is a local and social history museum located in Linthorpe within the borough of Middlesbrough and the ceremonial county of North Yorkshire, England. From its official opening on 1 July 1904 initial thematical leanings were towards the natural sciences, although galleries of the local Linthorpe Pottery, work by eminent Victorian industrial designer Christopher Dresser and the history of Middlesbrough, have largely replaced this emphasis. The remains of the original Victorian/Edwardian collection of stuffed and mounted animals is now in a single room, the Nelson Room, and consists of various taxidermied birds in their original cases with painted decorative backgrounds, and a variety of birds' eggs. Captain Cook Birthplace Museum is a public museum located in Stewart Park in Marton, Middlesbrough within the borough of Middlesbrough and the ceremonial county of North Yorkshire, England. It is one of three institutions run by the Middlesbrough Museum & Gallery Service along with the Dorman Museum and the Middlesbrough Institute of Modern Art (mima). Linthorpe is an inner-suburb, and former village in the unitary authority of Middlesbrough, in the ceremonial county of North Yorkshire, in North East England. The Lincoln Arboretum is an 22 acres (8.8 ha) park in Lincoln, Lincolnshire, England. The park has two ponds and varied tree cover, and was designed and laid out between 1870 and 1872 by the celebrated Victorian gardener Edward Milner. The arboretum is a park of grade II importance. Henry William Ferdinand Bolckow, originally Heinrich Wilhelm Ferdinand Bölckow, was a Victorian industrialist and Member of Parliament, acknowledged as being one of the founders of modern Middlesbrough. John Vaughan, known as Jacky, was born in Worcester on "St Thomas' Day" in 1799, the son of Welsh parents. He worked his way up the iron industry, becoming an ironmaster and co-founder of the largest of all the Victorian iron and steel companies, Bolckow Vaughan. Where Henry Bolckow provided the investment and business expertise, Vaughan contributed technical knowledge, in a long-lasting and successful partnership that transformed Middlesbrough from a small town to the centre of ironmaking in Britain. Bolckow, Vaughan & Co., Ltd was an English ironmaking and mining company founded in 1864, based on the partnership since 1840 of its two founders, Henry Bolckow and John Vaughan. The firm drove the dramatic growth of Middlesbrough and the production of coal and iron in the north-east of England in the 19th century. The two founding partners had an exceptionally close working relationship which lasted until Vaughan's death.